Amazing 5 Star Luxury Hotels Peloponnese – we have been regular visitors to the Peloponnese since before the children were born and we love it so much we bought our own house there in Stoupa. I take a keen interest in all the new luxury hotels that are springing up because I love the area, and if you have read any of my other articles you will know that I love luxury hotels! There are some truly stunning luxury hotels in the Peloponnese, so many more now than when we began visiting all those years ago. There are several that are high on my bucket list to visit, and I shall share them with you. 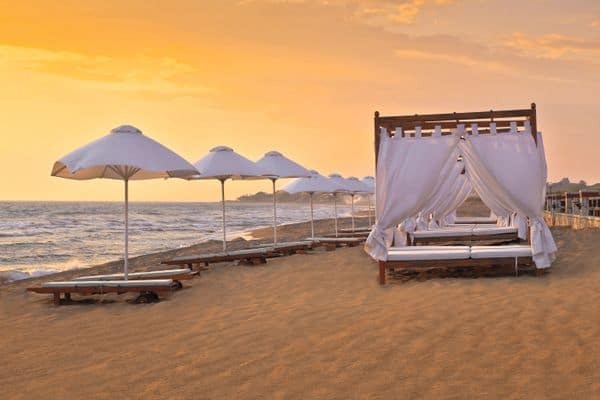 In Messinia on the South West Peloponnese you will find Costa Navarino, a resort split into two distinct areas, The Romanos, a ‘luxury collection resort’ and The Westin Resort. From their website, The Romanos sounds more adult and a perfect honeymoon destination: Set amid lush olive groves overlooking the storied waters of the Ionian Sea, this Luxury Collection Resort offers luxury rooms, suites and villas ranging from 43m² to 192m² along with the magnificent 630m² Royal Villa Methoni and 660m2Royal Villa Koroni. All attractively appointed to create a distinctive and inspiring environment of authentic luxury and heartfelt hospitality in the Peloponnese, Greece, featuring private infinity pools and incredible vistas. 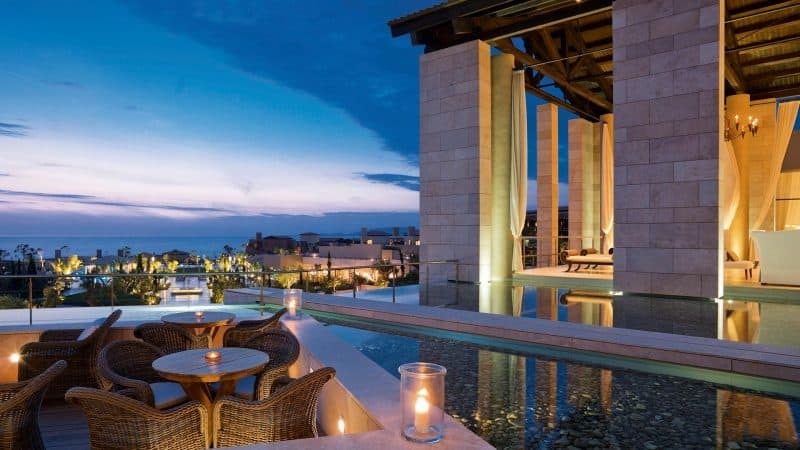 While The Westin Resort sounds the ultimate in luxury for family holidays: The Westin Resort has been voted one of the best resorts in Greece and one of the foremost holiday destinations in Europe. In 2017 The Westin Resort Costa Navarino has been voted among the Best Resorts in Europe in Condé Nast Traveller Reader’s Choice Awards. It features an amazing selection of deluxe rooms, family rooms and suites in a privileged seaside location on a verdant hillside that affords an alluring mix of golf, sea and pool views. This beachfront residence conjures the glamour by bygone eras. It is a journey of the imagination, steeped in memories, romance and charm. The ultimate spa resort. Inspired by the sanctuary at ancient Olympia, this exclusive beachfront hideaway is sprinkled with classic elegance. A cosy hotel beautifully allocated amongst forest, evoking the ‘seventies’ era adorned with mirrors, colours and patterns. The Horizon Blu in Kalamata is right on the beach, (across a busy road admittedly, but you can’ get much closer to the beach!). It’s just a ten minute drive from Kalamata airport and is a great location for exploring the rest of the Peloponnese, being fairly central and next to the fairly new motorway. Luxury hotels Peloponnese, from their website: Brand new on the waterfront promenade of vibrant Kalamata, Horizon Blu 5* hotel combines a great location, contemporary design, exquisite services and a wealth of facilities available to all travellers – business or pleasure – and visitors alike. 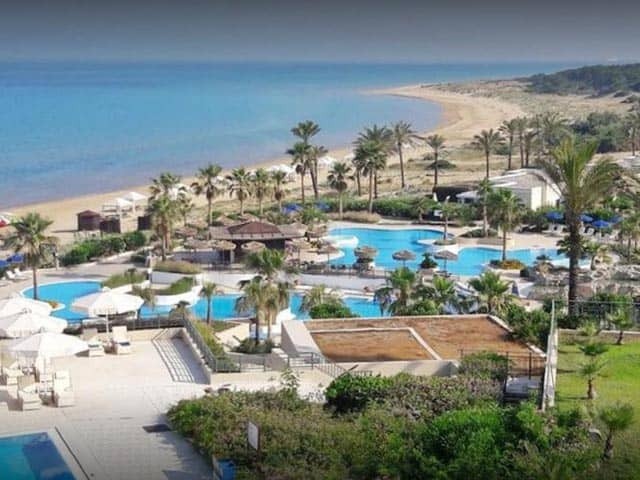 This luxury resort is located in Skafidia on the Greek Peloponnese. Offering ultra-stylish accommodation it is the ideal place for a healthy and relaxing break, and the chance to experience the wonderful Greek hospitality, food and weather. For those that want to explore it’s close to several fascinating UNESCO listed sites, including the Archaeological Site of Olympia that has been inhabited since prehistoric times, and was the birthplace of the Olympic Games in 776 B.C. The islands of Zante and Kefalonia are also easily accessed by ferry from the post of Kyllini. If luxury villas are more your thing, have a look at Bassa Maina Villas on the Mani Peninsula or our own Villa Serendipity in Stoupa (maybe not as high end luxury as the above hotels, but beautiful nonetheless and very reasonable prices! ).